As Canadians, we have a lot to be proud of and celebrate. Our diverse populations, beautiful landscapes, and beautiful summers are all worth being thankful for. This Canada Day long weekend, why not gather family and friends for a day of fun, games and food? If you are planning your Canada Day celebration and need a little inspiration, look no further. Crepe Delicious has the menu covered as well as some fun ideas to celebrate our nation’s big day! Enjoy the Outdoors – Whether you have the backyard space, a cottage with a few spare bedrooms or mattresses, or plan to visit a nearby park, Canada has gorgeous summers. They aren’t long though, so celebrating the country outdoors is a must for your party! Red and White All Over – Half the fun of holidays are the themes they bring to parties. Find some red cups, plates, flags, and encourage friends and family to dress with pride. Want to go a step further? Take the theme to your menu with our Love ‘Em Berries Crepe. It isn’t just filled with healthy seasonal berries; it also features our country’s colours and happens to be our feature this month! Satisfy your sweet tooth and enjoy this healthy treat. Get Catering from Crepe Delicious – We’ve all hosted a party and spent more time hosting than actually celebrating. Summer long weekends are precious, so spend your Canada Day celebrating with friends rather than cooking for everyone. Crepe Delicious offers mobile event catering for every space. While sweet crepes are perfect for dessert, we also have a wide variety of savoury crepes to please your guests for breakfast, lunch or dinner. Let us take care of the food while you enjoy your company. Keep it Simple – Not keen on a party or a crowd? Make the day special and celebrate with a sweet treat after dinner. Canadian summer sunsets are gorgeous and best enjoyed with a sweet crepe in hand. Gather up the family and head to your local Crepe Delicious for a Fruit Patisserie to taste fresh summer fruits, or indulge in a Nutella Banana Crepe or other favourite sweet temptation. 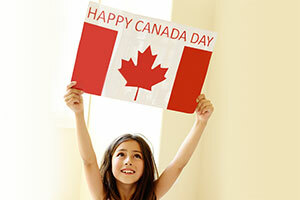 Crepe Delicious wishes everyone a very happy Canada Day. Celebrate with our wide selection of sweet and savoury crepes. Check out our menu and find a location near you to try your favourite flavour.